Were out again today, but although depleted in numbers still managed to move and re-wire about 40 posts, about 20 of which were renewed. 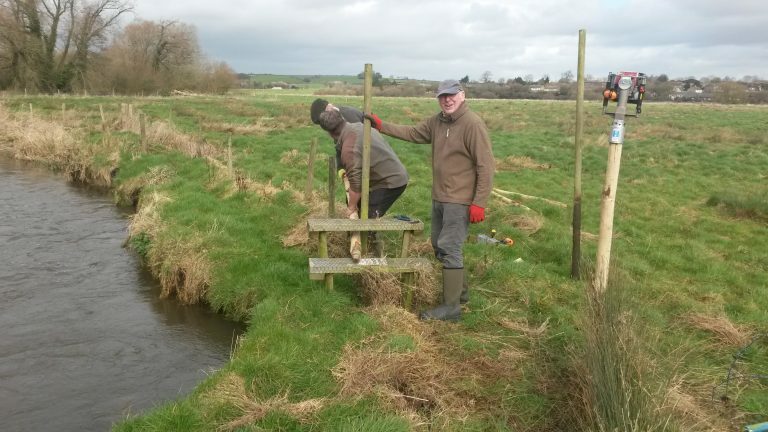 It was hard graft as all the posts had to be hand carried from Whitfield hatches about half a mile upstream – this was necessary as John’s truck was bogged down axle deep requiring a shove out by the team as job #1. John’s chariot safely un-bogged, the team set to work. The banter came thick and fast but the jokes are still awful. Excellent coffee break [thanks Brian] picnic lunch [thanks John] and even fortified with mulled wine. My word these guys know how to do it! As you can see from the pictures, the work was tackled cheerily and with a sense of stile (! ).